I do a cold water start, and bring my eggs to a boil for a few minutes. Take off heat, and let sit for 20 minutes covered in the hot water. Cool and peel your eggs, slice in half and pop out yolks in a bowl. 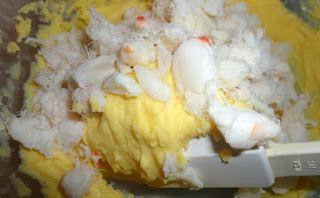 Break up yolks with a fork, and add a little lemon juice and some mayo until you get a nice fluffy consistency. I like to use a hand mixer to get rid of all the lumps. Fold in your crab meat and fill your egg halves. Top with a shrimp and sprinkle lightly with old bay seasoning.